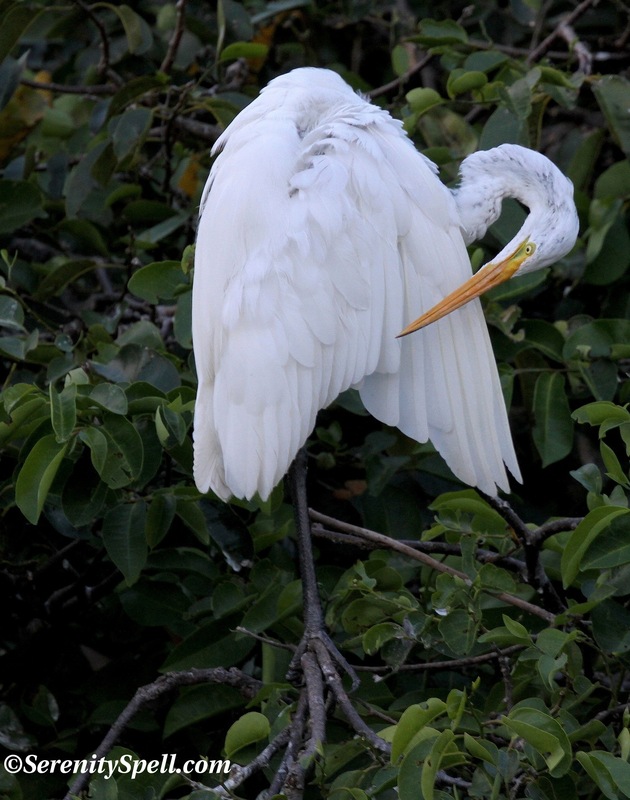 During a recent dusk trip to the wetlands, a Great egret preened…extensively…in a rookery, in preparation of the night. And human males complain of women’s bedtime preparations. Wonderful shots of this beauty! They do seem to spend quite a lot of time preening don’t they? Thanks so much! Oh seriously… I gave up after a half-hour, and s/he had been at it for long before then. Heh! 🙂 I need to learn something from that. Time for a massage? Hahahah! Oh nooo… Well, that sounds like me. Except I’m not usually sitting (for fear of gators) for long amounts of time, hah! But with this guy/girl, I stood for a half-hour, and I actually got a sunburn. Really? At dusk? That’s great there were fish everywhere, and he couldn’t be bothered! So spoiled. You know, I’ve seen flamingos, geese, etc., tuck their heads under their wings while napping. I wonder if egrets due that too? Honestly, I’ve seen them at rest in different poses… But I’ve definitely seen them tucked in like that, too!! IT DOESN’T MATTER WHO WE ARE – WE ALL LOVE THE GAME OF PEEK-A-BOO!!! Too cute, enjoyed your post one more time. Keep up the great work! Thanks so very much for your kind words! I love these guys… I’ll wait with them as long as it takes, hee! Your wildlife shots are amazing – great lightning ones, too, in an earlier post. I love our herons and egrets, I’m always fascinated by their eyes — and wait till breeding time, when they really come alive! (He) looks sooo shiny. awesome picks and shoots. thank YOU for sharing. What a beautiful set of photos. It does take patience, and a little luck, to get such marvelous shots. Hee’s a weird question from someone who doesn’t know – do they preen one another, or just ignore the feathers they can’t get to, like on their neck? 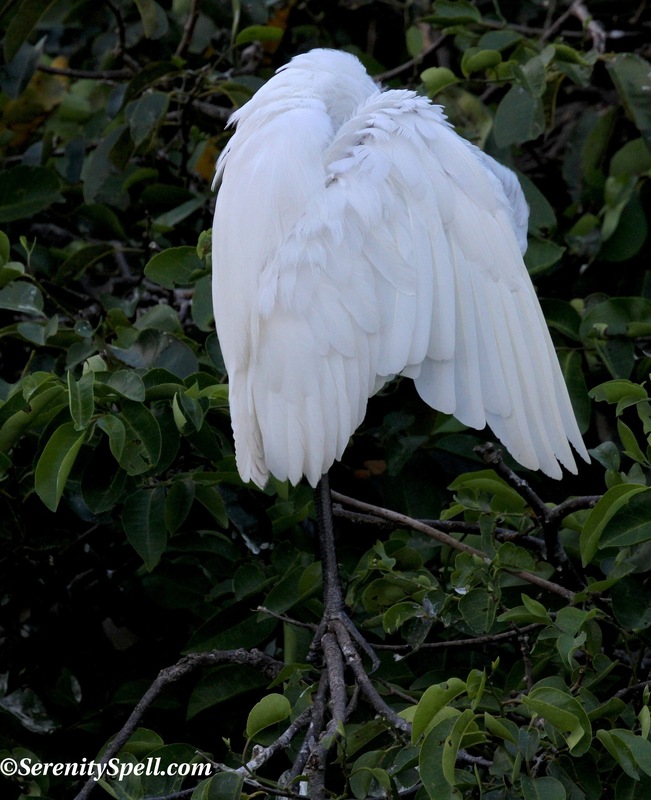 That’s not a weird question at all… Very funny, but I’ve NEVER seen the Great egrets preening each other. I *have* seen the Great blues preen each other, though. I’m going to keep an eye on the egrets during breeding / nesting season, though. Usually during this time, their necks are pretty dirty! Sometimes I think they’re hurt, but nope… it’s just wetland/swamp grime! Not able to access those spots, heh. I can’t get over those beautiful feathers! Heh heh! Sometimes shooting them in the rookeries can be tough… What gets me is how much their legs look like the tree branches! Not these guys, but the great blues, my guy calls “things from ‘Mimic’.” When they huddle over a certain way, they really do have that appearance. Uncanny.